Forum Description: The purpose of this forum is to provide daily Afghanistan news about events in Afghanistan and provide an opportunity for readers to comment on it in a constructive manner. US Defense Secretary Jim Mattis and NATO chief Jens Stoltenberg renewed their commitment to Afghanistan Wednesday, as insurgents fired rockets that killed one person and wounded four in Kabul. Mattis is the first member of US President Donald Trumpâ€™s cabinet to visit the country since Trump pledged to stay the course in Americaâ€™s longest war. In a sign of the nation's continuing insecurity a volley of rockets landed on a house near Kabul international airport hours after Mattis flew in, the interior ministry said. One person died and four others were wounded -- all from the same family -- in the assault claimed by the Taliban, which said on social media the missiles had been aimed at Mattis's plane. The Islamic State's local Khorasan province affiliate also claimed responsibility, as security forces were locked in a stand-off with the attackers. The unannounced high-level visit came as Afghanistan's beleaguered security forces struggle to beat back the Taliban, which has been on the offensive since the withdrawal of US-led NATO combat troops at the end of 2014. Mattis, along with Stoltenberg, was to hold talks with President Ashraf Ghani and other top officials to discuss the US-led NATO "train and assist" mission -- designed to strengthen Afghanistan's military so it can defend the country on its own. 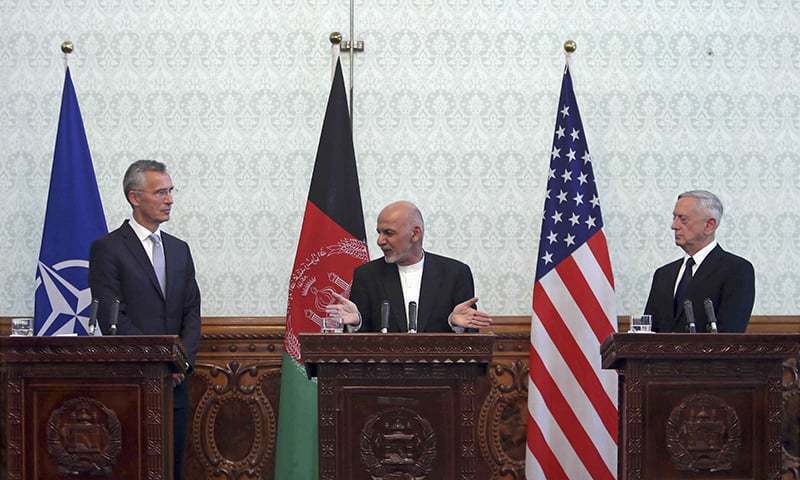 At a joint news conference with Ghani at the presidential palace Mattis and Stoltenberg pledged the support of US and NATO allies to the Afghan conflict, and expressed determination to stop the country becoming a safe haven for terrorists. "We will not abandon Afghanistan to a merciless enemy trying to kill its way to power." Stoltenberg said: "The more stable Afghanistan is the more safe we will be," adding that more than 15 NATO members had agreed to send additional troops. October marks the 16th anniversary of the start of the war. America is pressing NATO partners to increase their own troop levels in the country to help Afghan forces get the upper hand in the grinding battle against the Taliban and Islamic State. On allegations that Iran and Russia are actively propping up the Taliban, Mattis said it would be "extremely unwise if they think they can somehow support terrorism in another country and not have it come back to haunt them". Critics have questioned what the extra US soldiers can accomplish that previous forces -- who numbered some 100,000 at the height of the fighting -- were unable to do. Earlier this year Ghani ordered a near-doubling of the country's Special Operations Command -â€“ the elite fighting force spearheading Afghanistan's war against insurgents -- from 17,000 as part of a four-year plan that also aims to strengthen Afghanistan's air force. Earlier this week US watchdog agency SIGAR criticised US efforts to train Afghanistan's security forces, saying they were being hampered by slapdash instruction, shoddy oversight and failures in governance.